We are looking forward to the Regional Movement Building conversations and hope that many of you are able to participate. At the heart of these conversations we seek to build deep connection and understanding with each other. Join us, register today. Earlier this month, I was part of a national movement building conversation between nine state coalitions directors and twelve tribal coalition directors – indigenous and non-indigenous women working together toward the mutual liberation of all our peoples. It was the first time that a space was created for tribal and state coalition directors to come together. We reconnected to our purpose, listened more deeply, engaged in spirited inquiry without fear and discovered new perspectives and cultivated new relationships. We explored where there was difference and what was at the root of the difference. We spoke about shared needs and hopes. What we learned is that the needs and hopes of tribal coalitions and indigenous communities are so beyond what is written on a piece of paper. They are based on history, tradition, trauma, and value. 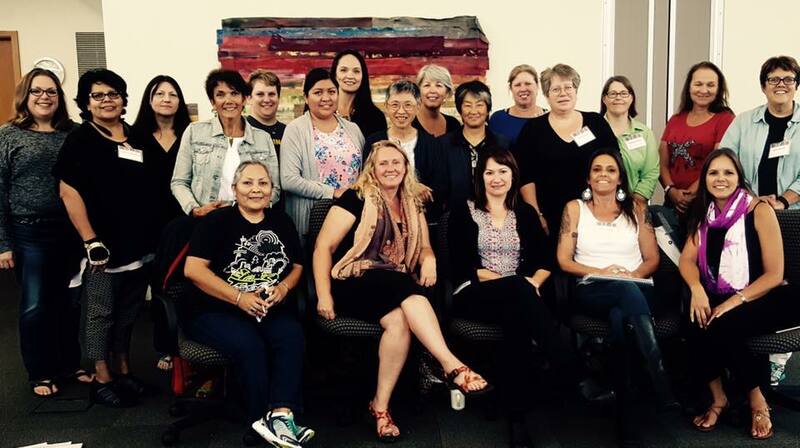 With relationships and cultural humility and the voice of indigenous women in the room, we were able to gain a deeper understanding on the interconnectedness between violence against women and violence against the earth. We spoke about the Dakota Access Pipeline and ways state coalitions could support efforts of sister tribal coalitions. We are excited to see the possibilities that may arise out of our time together. We hope that you will join us for our Regional Movement Building Conversations, where we will foster the quality of openness and an ability to have a big view of issues we all care deeply about, where we learn about our shared needs and hopes. Welcome Shoshone Paiute Tribal STOP Program! A recent visit with the Shoshone Paiute Tribal STOP Violence Program Team Director Zannetta Hanks and Outreach Coordinator Kaija Jones at their office in Owyhee, Nevada was yet another reminder of the incredible amount of commitment, heart, and soul advocates bring to their communities, and the challenges and rewards of rural advocacy. Owyhee is located on the Duck Valley Indian Reservation, about halfway between Mountain Home, Idaho and Elko, Nevada – about 1.5 hours to either community, through gorgeous, remote and rugged terrain. 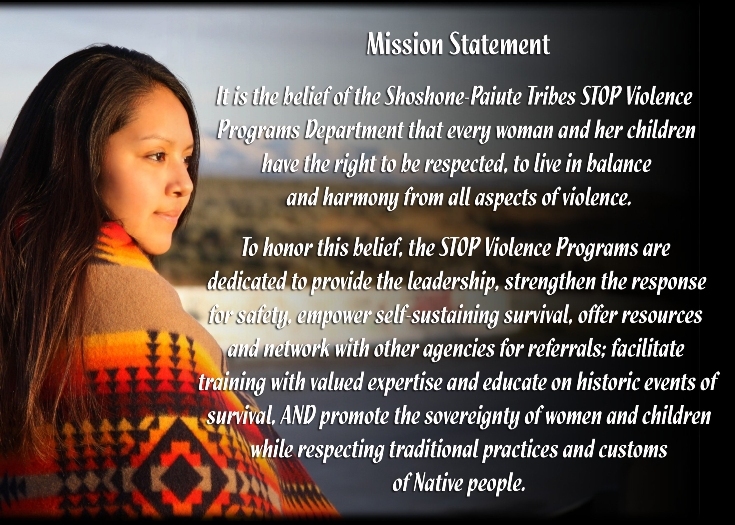 The STOP Violence Program is a team of four, serving the Shoshone Paiute Tribe by providing mobile advocacy, batterer treatment, support and activity based healing groups, and youth education and organizing. Zannetta is the new Director of the STOP Program, and comes with experience in the child welfare system and social work – and – no surprise – is a very busy woman! Zannetta spoke of the challenge of balancing work and family life, when the work is never done, building statewide partnerships and program capacity, while also serving survivors. Because there is no shelter on or near the reservation, Zannetta or another team member must transport survivors in need of shelter. Zannetta and her team greatly appreciate programs who are open and accessible to providing shelter and related services for survivors from their community. Kaija is working with the Braves After School Program as a community partner to provide outreach to Jr. High students, a group that has grown tremendously over the past year. The group focuses on character and empathy building, along with relationship skills. Youth build other fantastic skills too – creating PSA’s on issues they care about (homelessness, suicide, animal rights, Dakota Access Pipeline, etc.) Youth express their interests and passion, and caring adults like Kaija provide guidance and opportunities. Youth are learning more about their culture and incorporating important cultural knowledge and practices into their activities. Non-native, and other Native programs may consider inviting the Sho-Pai youth group to visit their youth programs, to learn more about their culture, and issues that matter. Tina Gallardo is the program’s Advocate/Assistant. She works with victims/survivors along with assisting other staff with daily program needs. Tina works also works with the Women Batterer’s group, providing education and life skills. Russell Abel is the Men’s Re-Education Facilitator. Working with Male Batterers, he provides a 26-week group and collaborates with the Probation Officer and Tribal Court Staff. Russell offers assistance where he is needed for the program and the community. 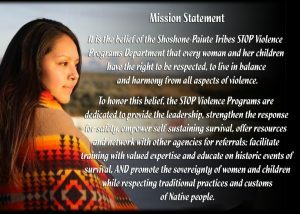 To find out more about the Shoshone Paiute STOP Violence Program or to contact Zannetta, Kaija, Tina or Russell, check out their website too! Mental illness touches our lives. 20% of youth 13-18 experience a severe mental disorder in a year (13% for 8-15); 1 in 4 adults experiences a mental illness in a year, not to mention the millions of loved ones that care deeply and yearn to provide whatever support is needed. Yet stigma holds communities back from treating mental illness like most other health issues: valid, important, and blameless. With stigma, it can take great risk to speak up – to break the silence, get support, and be wholly connected to a supportive system of care. Stigma can prevent loved ones from accessing what they need to be supportive and cope. 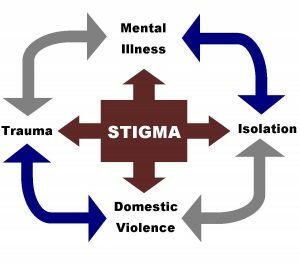 Stigma contributes to debilitating barriers when providers deny services, or do not provide trauma informed care, or fail to make reasonable accommodations for people with a mental illness. Stigma also can make it hard for protective families to talk to their children about their own, or the child’s mental illness. Domestic violence can lead to isolation and conditions such and depression, anxiety, panic attacks, substance abuse and posttraumatic stress disorder – for both survivors and their children. Abuse can trigger suicide attempts, psychotic episodes, and impede recovery. People with a mental illness are more vulnerable to experiencing domestic violence, and survivors of domestic violence are at greater risk of experiencing a mental illness. Children in homes experiencing domestic violence or with parents who are mentally ill are at greater risk of developmental and mental health issues. 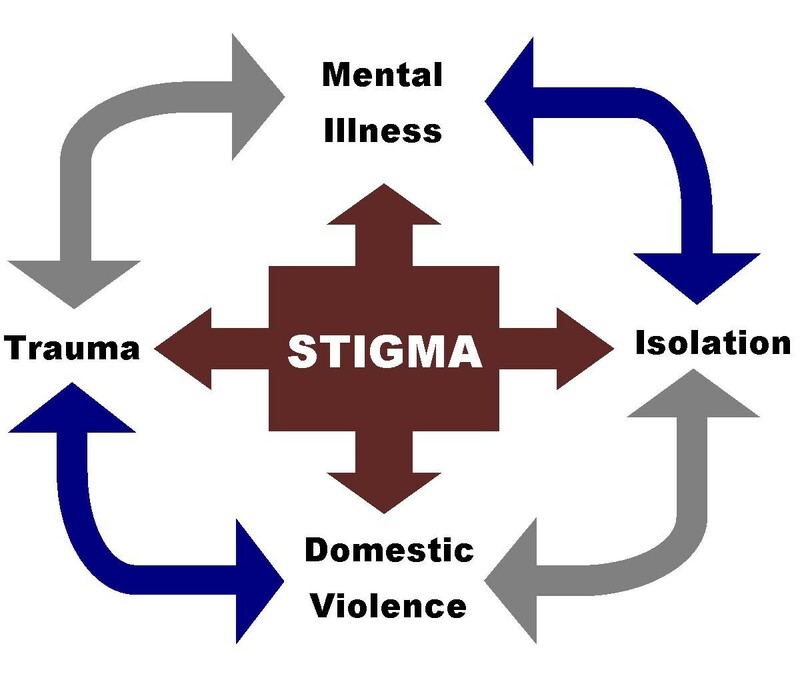 Stigma in our society associated with experiencing mental illness or domestic violence can create major hurdles and sometimes insurmountable barriers to receiving the community connections and services needed for safety and optimum health. Despite effective treatments available, long delays exist between symptoms onset and treatment. Children and people of color are among those that experience the longest delays to treatment. Many survivors of domestic violence who are also experiencing mental illness have their symptoms resolve once they and their children are safe and have the support they need. Others may need ongoing care throughout life to reach their full potential. Children who have at least one nurturing, consistent safe adult in their life can be incredibly resilient. As a community it is our responsibility to open doors however we can. We and/or our organizations must act! Reduce stigma. Dispel myths. Speak up! Support actions which create access to services, and reduce stigma. Bookmark resources at the end of this page! Sign petitions! Understand mental illness can be viewed and experienced differently across cultures – so can healing practices. Facilitate connections for families, not just individuals. Ask them what might be helpful to them and their family. Go the extra mile. Focus on enhancing well-being in addition to safety. Respond better to challenging behaviors. Don’t personalize symptoms or behaviors. Create solid partnerships between mental health and DV sector. Know the resources and people. Calming, personal, youth and family friendly environment reflective of anyone you may serve i.e., all ages, cultures, gender/orientation. Provide accessible services, balancing individualized flexibility with structure. Build organizational and individual wellness into workplace policies and practices. 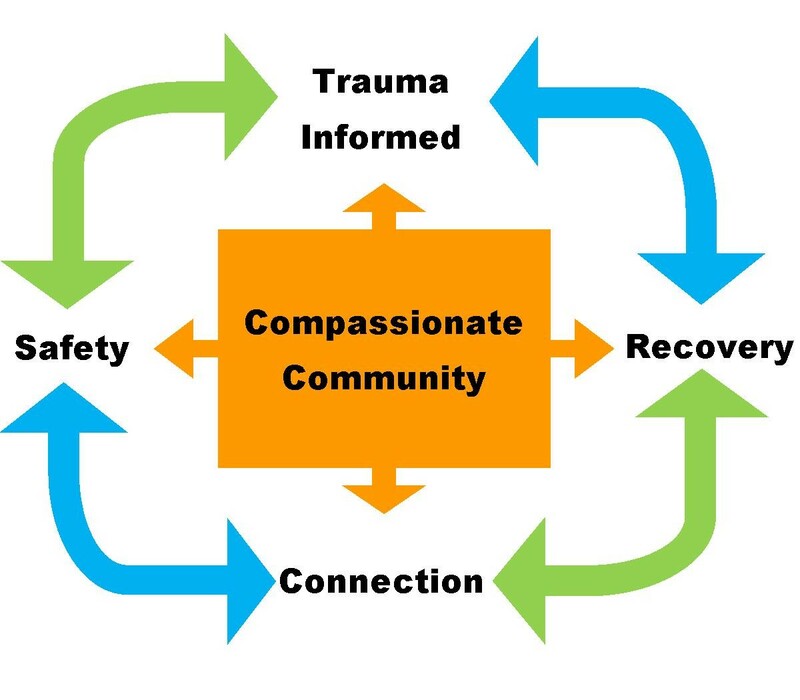 Let’s reduce stigma of mental illness AND of domestic violence – and create compassionate communities where everyone is safe and free to reach their full potential!! Dual programs serving individuals impacted by sexual violence and domestic violence are often challenged by limited organizational resources and limited finances for their sexual violence work. Organizational policies, training, and culture guide advocates on how to respond to the individuals they work and should reflect the importance of serving both individuals impacted by domestic violence and individuals impacted by sexual assault. The Resource Sharing Project recently released a guide called Opening our Doors: Building Strong Sexual Assault Services in Dual and Multi-Service Advocacy Agencies. This guide explores the challenges dual agencies often face in providing robust, multi-faceted services to individuals impacted by sexual assault. Dual agencies, especially rural agencies, often state that they just do not see as many survivors of sexual violence as they do individuals impacted by domestic violence. The prevalence rates for sexual assault, however, are nearly as high as they are for domestic violence. So if we are not seeing sexual assault survivors through the doors of our agencies, what does this tell us about our organization and the culture we live in? Outreaching to individuals impacted by sexual assault takes specific outreach efforts. It involves taking a look at our organization- our name, the services we provide and the partners we involve in order to evaluate if we are accessible to individuals who have experienced sexual assault. While most individuals who have been sexually assaulted know the person who harmed them, not all sexual assault happens within the context of intimate partner violence. The age range with the highest prevalence of sexual assault is individuals 11-24. What are we doing to provide services and outreach to those individuals, to let them know that our agency is willing and prepared to work with them? While many of us are known in our community for providing services for domestic violence, are we known for standing up and speaking on behalf of individuals who have been sexually assaulted? As a dual coalition, it can be difficult for us to ensure that we are also equally focused on sexual assault. Are we analyzing the very practices, messages, and partnerships that we engage in to determine if they are welcoming and accessible to individuals impacted by sexual assault? Across the state, statistics are showing that sexual assault survivors are not accessing services from dual agencies on a rate that compares to the victimization they are experiencing. Where are survivors of sexual assault seeking help? Strong dual/multi-service agencies have a mission, strategic plan, and specific goals established for their sexual violence programs. Strong dual/multi-service agencies have strong leadership that is committed to addressing sexual violence. Strong dual/multi-service agencies understand the connection between sexual violence and oppression and work to end both. Strong dual/multi-service agencies provide services to the full continuum of sexual violence survivors, including adult and youth. Strong dual/multi-service agencies provide comprehensive sexual assault services that meet long-term and short-term needs of sexual violence survivors. Strong dual/multi-service agencies provide specific advocacy training on sexual violence and core service provision. 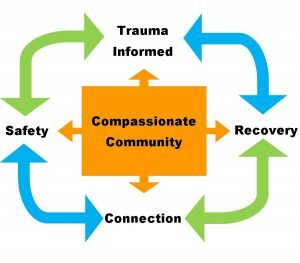 Strong dual/multi-service agencies have a plan that is both proactive and responsive to vicarious trauma experienced by staff and volunteers. Strong dual/multi-service agencies work with systems. Strong dual/multi-service agencies listen to the community. Strong dual/multi-service agencies speak to the community about sexual violence. If your organization would like assistance in strengthening the work you do on behalf of individuals impacted by sexual assault, please contact Jennifer or Melissa. We are excited to announce that Lynn Rosenthal, Former White House Advisor on Violence Against Women and most recently with the National Domestic Violence Hotline will facilitate our conversation and share her perspective on the essential role of community and tribal domestic and sexual violence programs to create social change. Science tells us that it takes 21 days to break a habit and we are well on our way! By now, we hope you’ve learned that your mind, body, and spirit are beautifully interconnected. This poem introduced by our faculty member, Norma Wong, demonstrates what it means for YOU to be connected to your mind, body, and spirit. Remember that old adage that smiling and laughing can instantly make you feel better and happier? Find a video clip, gif/meme, or photo that has never fails to make you smile. 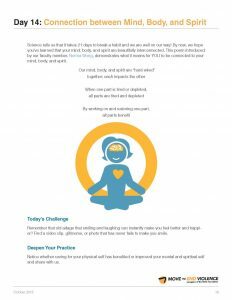 Notice whether caring for your physical self has benefited or improved your mental and spiritual self and share with us. Visit the online store to view current Idaho Coalition materials available for order. For store questions, please contact Lacey Sinn or call 208-384-0419 ext. 314.